Ahmadinejad knows that advocating better relations with the US will not advance, but he is determined to remain in politics. By repeating his proposal five times and in different venues, he tries to establish that what he said was not a fluke. The Iran-Iraq war ended in 1988 and was followed by the death of Ayatollah Khomeini, the leader of Iran’s revolution, in June 1989. Ayatollah Khamenei assumed power, becoming Iran’s second Supreme Leader a few days later. Shortly thereafter, Hashemi Rafsanjani was elected as Iran’s president. Rafsanjani’s platform was to re-build the war-torn country under his ambitious “construction program.” To achieve that, Rafsanjani needed capital and political stability. Thus, he was determined to minimize tensions with the West, including the United States. Rafsanjani’s advisers reported that his foreign policy centered on detente with foes and expanding relations and cooperation with friends. In 1997 the reformist Mohammad Khatami was elected as president. The Khatami administration pursued essentially the same foreign policy with a tendency toward warmer relations with the West. During his tenure, Iran espoused dialogue and cooperation with the US on numerous occasions. One such example of frequent mention is Iran’s 2003 offer for a grand bargain which was rejected by the Bush administration. Another outstanding example is Iran’s cooperation with the US in the war against the Taliban. During the US-led operations intended for ousting the Taliban, Iran provided active intelligence and logistical support. It also cooperated with the US, and played a major role in the formation of a new Afghan government at the Bonn Conference in 2001. Without Iran’s support, the Bonn Conference could have not succeeded. These developments intensified the Iran leadership’s deeply rooted mistrust towards the West, and prepared it for abandoning conciliatory policies. The seals that had been placed by the International Atomic Energy Agency (IAEA) on their uranium enrichment equipment were broken and Iran abandoned the two-year, voluntary suspension of its nuclear program. America, under the slogan of sponsoring democracy, explicitly talks about regime change in one of the most democratic countries in the region and the world...[Therefore, at this point] Iran would adopt a new strategy...[based on] confrontation with America’s unilateralism in all global stages. Fast forward five years. Iran’s president, Mahmoud Ahmadinejad, whose second term expires in June 2013, visited the UN General Assembly in New York in late September and presented for several interviews. In each of his interviews with Japan’s NHK, Associated Press, CBS, and The New York Times, he proffered reconciliation with the US. During a meeting with 150 American professors and students, he maintained that, “Iran recognizes the United States and believes that we can have relations.” He added, “The Islamic Republic of Iran is prepared to expedite relations between the two countries, revising its negative view toward the US, provided that the US takes a step to create understanding between the two countries.” Ahmadinejad’s reiteration could not be accidental. The voices demanding Ahmadinejad’s resignation, even in Iran’s parliament, resonate louder each day. He is under attack from all political affiliations for his mismanagement, lack of cooperation with differing political factions, and for his apathy toward Iran’s current economic crisis. In his nationally televised and widely-anticipated October 2 press conference regarding Iran’s national currency crisis, Ahmadinejad presented no solution or plan. Instead, he directly attacked the speaker of the parliament, Ali Larijani; the judiciary branch; Tehran’s municipality; and indirectly, Mohammad Bagher Ghalibaf, Tehran’s Mayor, said to be a favorite for winning the June 2013 presidential election. 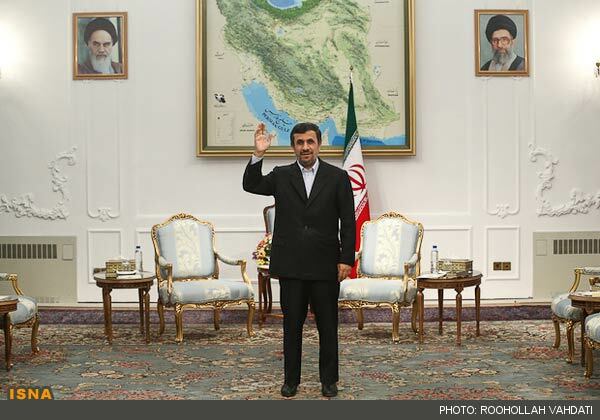 Ahmadinejad also sharply criticized the Fars News Agency, affiliated to the Iran Revolutionary Guard Corp. (IRGC), as one of the factors that has contributed to the rial’s nosedive. To aid in speculation behind these maneuvers in New York, two developments are noteworthy. First, in June 2012, in an interview with German newspaper,Frankfurter Allgemeine Sonntagszeitung, Ahmadinejad stunned many in Iran by stating he planned to leave politics upon expiration of second term. He said that he had no intention of following the Putin-Medvedev example and that he would “return to scientific work” rather than forming a political party. So, if the disquieted Ahmadinejad clearly knows that Washington would not take his overtures for better relations seriously, what motivated his adoption of such a conciliatory tone? Iran's collapsing currency and other economic maladies have created a dangerous situation for anyone who may ultimately be blamed and convicted in the court of the Iranians’ public opinion. The situation is so precarious, that even the US government, who has relentlessly espoused that sanctions are working, backed off in the wake of Tehran’s jolting riots, and blamed the Iranian government rather than claiming a victory for US policies. Ahmadinejad knows that advocating better relations with the US will not advance, but he is determined to remain in politics. By repeating his proposal five times and in different venues, he tries to establish that what he said was not a fluke. He intends to convince Iran’s people that he is the man who wants to bring the US-Iran conflict to an end, thus ridding their country from sanctions, but that he is prevented from doing so by his opponent. Ahmadinejad hopes to create a powerful grassroots support, helping him to return after the expiration of his second term, contradictorily, within the same framework of the Putin-Medvedev scenario. This article is part of Insider & Insight, a new AIC program aimed at providing different perspectives and analyses on key developments in US-Iran relations. The commentary and opinions expressed herein are solely those of the author and do not reflect the official position of American Iranian Council. Iran: Is Ahmadinejad Facing a Final Showdown with Rafsanjani? Netanyahu, betting 'all-in' for high stakes Iran game? US-Iran: Can there ever be a compromise?